North Kingstown, RI - Hexagon Manufacturing Intelligence North America today announced it will host a presentation featuring technology partner Hendrick Motorsports at IMTS (International Manufacturing Technology Show) 2016, Booth E-5202, McCormick Place, Chicago, IL from September 12 - 16, 2016. Hendrick Motorsports is the legendary winner of a record 11 NASCAR Sprint Cup Series championships and one of NASCAR's most successful auto racing teams. Doug Duchardt, general manager of Hendrick Motorsports, and Brandon Evans, Engineer, will deliver a presentation entitled "Becoming a 'Why Not?' Engineering Culture" on Wednesday, September 14 from 1:30pm - 2pm. This special event will directly follow Hexagon's Press Conference being held from 1pm - 1:30pm in Booth E-5202 on Wednesday afternoon. The press is requested to RSVP via email: belinda.jones@hitechmarketing.com or 860-399-1147. This exclusive presentation will cover how Hendrick Motorsports utilizes intelligent measurement technology to foster a "why not" engineering culture driving productivity and innovation into their quality operations. Attendees will learn how their engineering team uses advanced metrology processes, measurement data and root cause analysis to accelerate development cycles and consistently improve their manufacturing processes. This session will provide a close-up look at a dynamic team pushing the boundaries of manufacturing and metrology to ensure repeatable wins on the track. 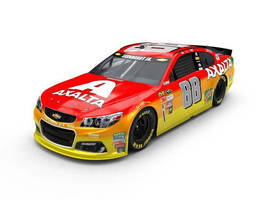 Hexagon will showcase a #88 Axalta racecar from Hendrick Motorsports in their booth during IMTS.